Motorised cleaning road isolation with a remote control panel for depots. 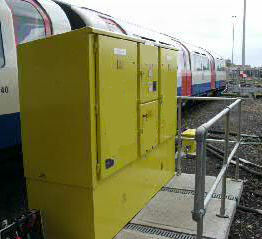 IP55, 3mm steel enclosure, protected for external use. Plinth mounted, cable entry from below via aluminium gland plates. Cabling is 2 x 935mm2 for traction positive and 2 x 935mm2 for traction negative.